a tremendous opportunity for savings. Yet we are making progress. A McKinsey study reported that since 1980, energy consumption per unit of floor space has decreased 11 percent in residential and 21 percent in commercial sectors, while industrial energy consumption per real dollar of GDP output has decreased 41 percent. Data Centers are booming Information Factories. In 2013, U.S. data centers consumed an estimated 91 billion kilowatt-hours of electricity, equivalent to the annual output of 34 large (500-megawatt) coal-fired power plants. Data center electricity consumption is projected to increase to roughly 140 billion kilowatt-hours annually by 2020, the equivalent annual output of 50 power plants, costing American businesses $13 billion annually in electricity bills and emitting nearly 100 million metric tons of carbon pollution per year. 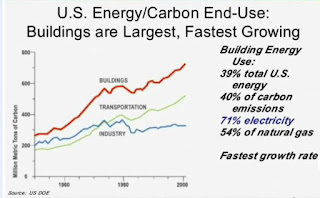 Advanced building systems can reduce energy requirements by more than 50%. These are variables for the sustainable framework of energy and power consumption for the modern buildings. Plus the water is far more efficient as the implementation of the rain water basin.